Made of black luxury crepe, with a black lycra built in leotard. 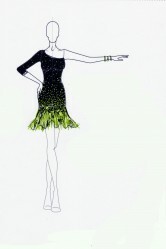 The skirt is embellished with light green goose feathers. The dress is stoned in green rhinestones (peridot, olivine) to match the feathers.